Alkesh Apartments are located in the plush places of Milimani Estate within Kisumu, 5 minutes from the marvel of the Lake Victoria, with easy access to the city center and only a 30 min drive from the Kisumu International Airport. You can reach the city center in a 15 minute walk. The apartments are the perfect place for relaxed mid to long-term housing in Kisumu impotenciastop.com. Offering around the clock security and state of the art electric fencing on an access limited compound. 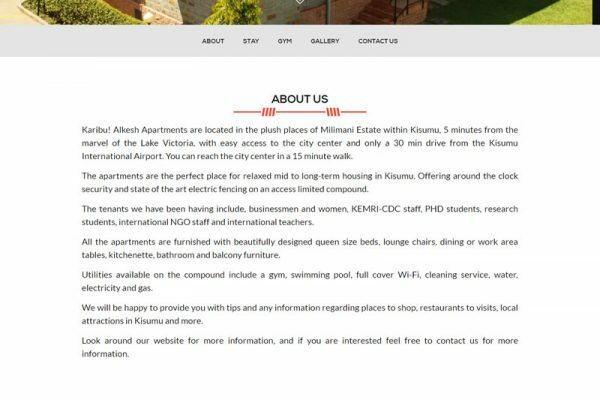 Alkesh Apartments needed to get online and show case the apartments to their target market, businessmen and women, KEMRI-CDC staff, PHD students, research students, international NGO staff and international teachers. 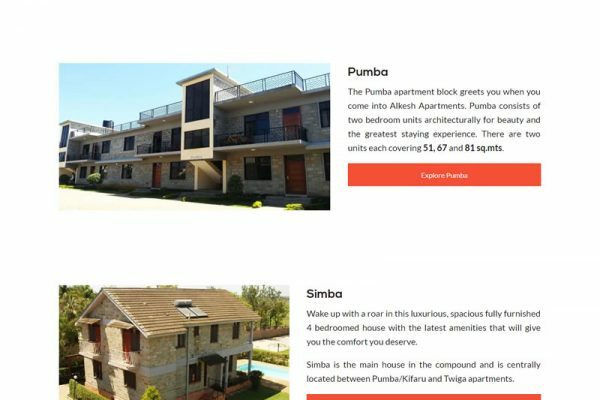 SNETTSCOM was contracted to come up with a visually appealing and functional website that would not only provide information about the apartments but also impart the feeling of staying at Alkesh Apartments. We came up with a unique custom design based on a CMS to enable the owners make changes easily.